Almost 400 miles of roadworks will be lifted to ease journeys over Christmas. The "roadworks embargo" will be in place on motorways and major A roads from 6am on December 22 until 12.01am on January 2, Highways England announced. More lanes will be open and many speed restrictions lifted due to the completion or suspension of roadworks. Millions of drivers will embark on a Christmas getaway with some journeys on popular routes likely to suffer from severe delays. December 23 could see the worst of the traffic as leisure trips coincide with regular commuters on the last working day before Christmas. More than 5,000 Highways England staff including traffic officers and control room personnel will be working to clear incidents and manage congestion over the festive season. The organisation's customer service director, Melanie Clarke, said they are "doing everything we can" to make journeys as smooth as possible. She went on: "Over the past two years we've already added 190 lane miles of much needed capacity and that will make life easier for those travelling around this month." 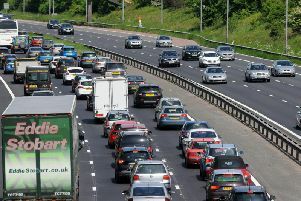 RAC spokesman Rod Dennis said the lifting of roadworks will be welcome news for millions of shoppers and commuters with "stress levels bound to increase as we get closer to the 25th". But he warned the measures will not eliminate hold-ups on particularly busy parts of the road network. He added: "We strongly recommend drivers plan their journeys carefully and try and avoid peak times if they can. "Those on the hunt for Christmas gifts are advised to stick to weekdays for their shopping wherever possible, to avoid the inevitable jams that are characteristic of the last few frantic weekends before Christmas."